Project Alicia : What the Crap? Do we have some strange odor that attracts birds? Do we reek of death over here? Do we look like the grim reaper? These are the questions that first popped in my head when I found not one, but two dead birds in our entry. Yep. Totally sick. Maybe not as sick as that hawk devouring the squirrel yesterday. But still pretty yucky... lying there belly up with their (larger than I expected) talons just frozen in midair. Eew. Then after hearing at least another dozen pings on our windows from unsuspecting birds… I did what I do best. And there it was in black and white. And then I felt oh so bad. Ok, so they’re not the smartest species. Even so, my kind heart is laden with grief that I didn’t respond sooner to those loud pings. Maybe there was little I could have done right then to prevent their untimely deaths, but I could have tried. you're a horrible animal abuser! did you have a funeral for that poor thing! i'm calling PETA on you! off topic but i wanted to thank you for the comment and follow! i went to school with a Rasmussen...Heber Rasmussen. That is crazy!! Sad and gross all at the same time!!! I love all your photo's AMAZING!! So funny. I've just started reading your blog in the last two days, and so far it's been all about animal deaths, complete with pics. I'm just going to assume you write about and photograph other stuff, too. 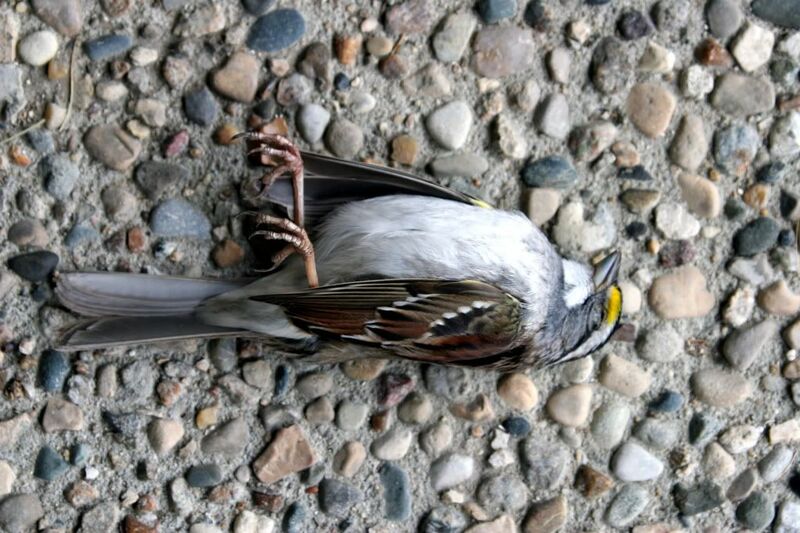 At least the bird didn't get in through a window and wreak some scary havoc inside your house. That's always fun. I guess if you stop cleaning your window, they'll stop! So, maybe it will be one less chore for you to do. :) My parents have a big picture window, and they've been having this problem for years. How sad. You can get little window stickies that should help. They are cute and make it so they can see the glass. That hawk eating the squirrel below is intense too. Whoa! Yeah, unfortunately, bird sometimes fly smack into our windows. It's horribly loud and awful to see them fall to the ground. I agree! That is crazy!! By the way, I meant to email you or message you. We're still private, but I added the follow button awhile back because I realized it was easier when people had it. :) I know it's hard to keep up with the "privates" who don't have a follow button. Sorry...I am laughing at the title of this post...I thought Crap was a Texas word!!!! Ok, I'm going to admit, when I first scrolled down to that picture, I giggled. There is something kind of humorous about it, no? But, now I am pouting because I really dislike learning of ways humans impede upon animal's environments. Gotta admit, the bird skeeves me out. However, your front entry is GORGEOUS (the pebbles in the cement). Love it! I've never known anyone from Iowa... esp. not someone as adorable as you!